If you see water bubbling up out of the street or flowing down the street, it could indicate a broken water main. To report a broken water main or a broken hydrant, please call 419-633-6100. If you need to make plumbing repairs to your house, you should find and shut off your master valve. Typically, the shut off valve is located on the water line where it enters your house. This may be in the basement, crawlspace, or utility room. A plumber can help you find your shut off valve or install one if you do not have one. The Water Department also maintains a shut off valve to your property, and we will shut off your service for you if necessary. This service is free if you are putting in or replacing a shut off valve. Additionally, there could be a time when your service line develops a leak, in which case we will shut off our valve so you can make repairs. 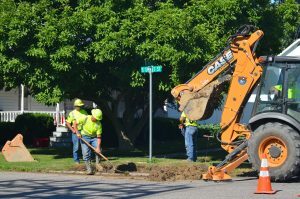 The Water Department only maintains the part of the service line to our valve, which is generally located on the street right-of-way. The portion of service line from the street right-of-way to your home is your responsibility to maintain and repair.